In addition to three brightness levels in steady burn mode, the Volt 700 comes with two flash modes. One is a typical fast single flash, bright enough for daytime visibility. The second is a steady beam which momentarily flashes brighter about twice per second. This steady-flash mode is nice around dusk and dawn, or during cloudy or rainy days. It’s less disorienting than the fast single flash, but the flash still grabs attention. The Volt 700 has an integrated lithium battery which can be recharged by a micro USB port on the bottom of the light. An indicator LED on the light’s button turns red as the battery gets low. During charging the indicator lights up red while charging, and then turns off completely when the light is done charging. This can make it difficult to tell if the light is actually finished charging, or if the charger accidentally got disconnected, and the first couple times I charged the light I was worried that maybe the light hadn’t charged. The battery can be easily unscrewed from the head of the light, allowing you to carry extras and swap them out as needed. Unfortunately the battery pack is a proprietary Cateye package, with a plastic enclosure and adapter encasing a standard 3100 mAh 18650 battery. You can’t use it in other lights, nor can you charge it with a regular charger – to charge an extra battery you have to either plug it into the light or buy a charging adapter for it, available for $15. While that is a reasonable price, the extra battery itself is $50. Considering that the actual battery cell itself would cost under $15 at retail prices, that price seems unreasonably steep. 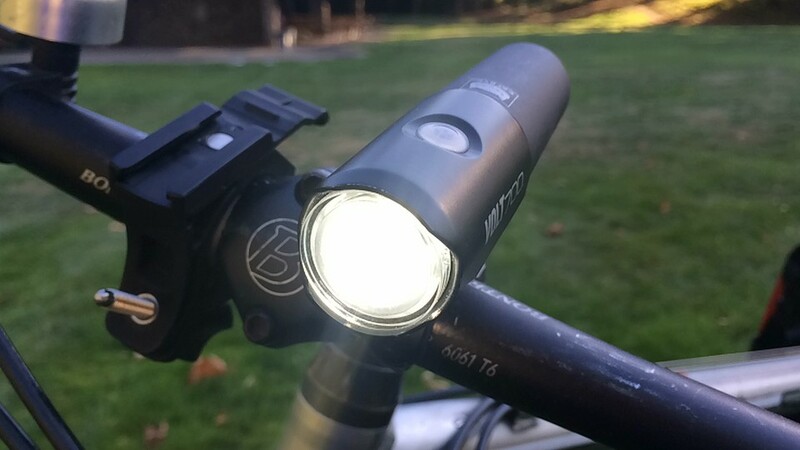 If you need a light with swappable rechargeable batteries, you may be better off with something like the Fenix BC30 or Lezyne Super Drive XL. With the included 3100 mAh battery the light lasts just over the 2 hours specified. Output is regulated to maintain brightness as the battery drains, although the brightness does start to trail drop after about an hour. Most other lights in this price and output range only last about 1:30 hours, so the Volt 700 is a step ahead with battery performance. I’m honestly not sold on the Volt series mount. Cateye’s “FlexTight” mount consists of a rigid plastic band which wraps around the handlebars and then can be tightened with a plastic thumbscrew. What’s annoying is that the excess plastic from the strap sticks out towards the rider. I’ve scratched my hands and wrists on the protruding sharp plastic several times now. 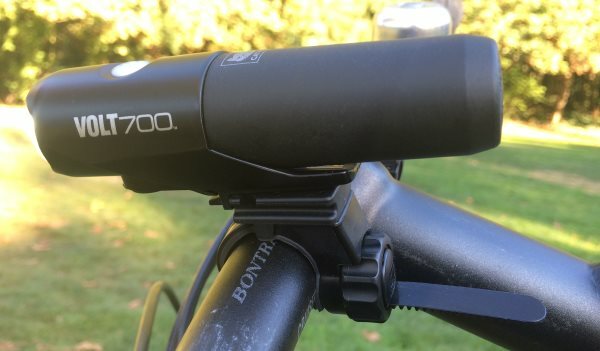 One could clip the excess plastic, but this would make it impossible to use the mount on a larger diameter handlebar later and could also create an even sharper edge. The light slides into the top of the mount, and is released by a plastic tab on the light. Typically the release tab is on the mount, not on the light, so it took a few times for me to get used to pulling up on the tab rather than pushing down to release the light. The good thing about this design is that the mount can fit almost any size and shape of handlebars, and is very secure. Even riding over rough terrain the light stays put. The light is entirely controlled by a single button on the top. A single push turns the light on and cycles through the modes. Pushing and holding turns the light off. The mode memory will remember what setting the light was on the last time you turned it off. The button is a bit small and can be challenging to operate with gloved hands, but the light is otherwise very easy to use. 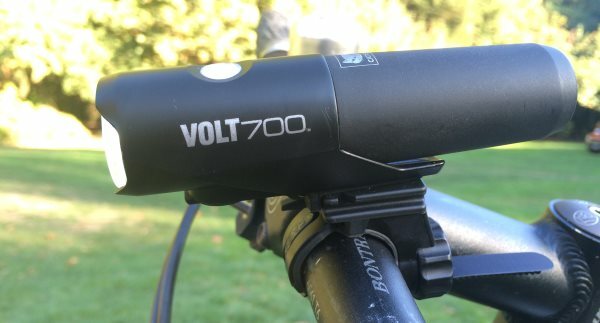 The Volt 700 is a nice light, and is priced similarly to other lights in its class. Its removable battery stands out – a few other lights like the Cygolite Expilion and Serfas TSL-750 have removable batteries, but the Volt is much slimmer than these, and its battery can be recharged externally. In terms of single-piece USB rechargeable headlights with removable batteries, the Volt 700 would be my top choice. However, that extra battery is absurdly expensive (not that extras for the other similar lights mentioned above aren’t too). 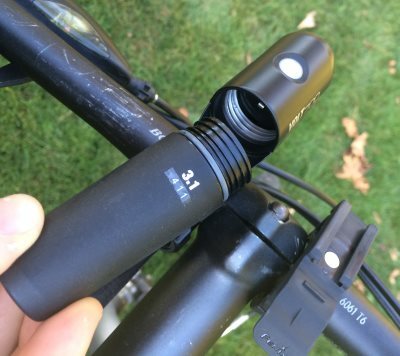 If you expect you’ll be replacing your batteries often and needing to swap them out on most of your rides, you should consider a light which takes regular 18650 batteries, like the Lezyne Super Drive XL or the Fenix BC30.